Purim is just around the corner, and I wanted a gragger project with a difference. May I present (drumroll please!) the “I Spy” gragger! 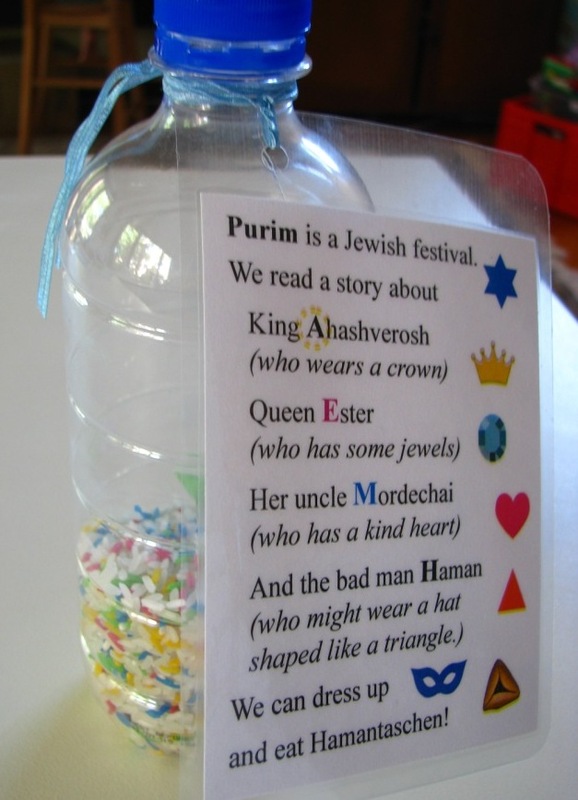 This craft activity combines two great ideas – 1. something to make noise when Haman’s name is mentioned during the reading of Megillat Esther at Purim, and 2. the I Spy bag (or in this case bottle). If you’ve never seen an I Spy bag, they are great: a collection of random (or not so random) small interesting objects hiding in a sea of small pellets, awaiting your discovery. I bought one for my daughter when she was younger, and I think I enjoyed finding the items in it even more than she did! 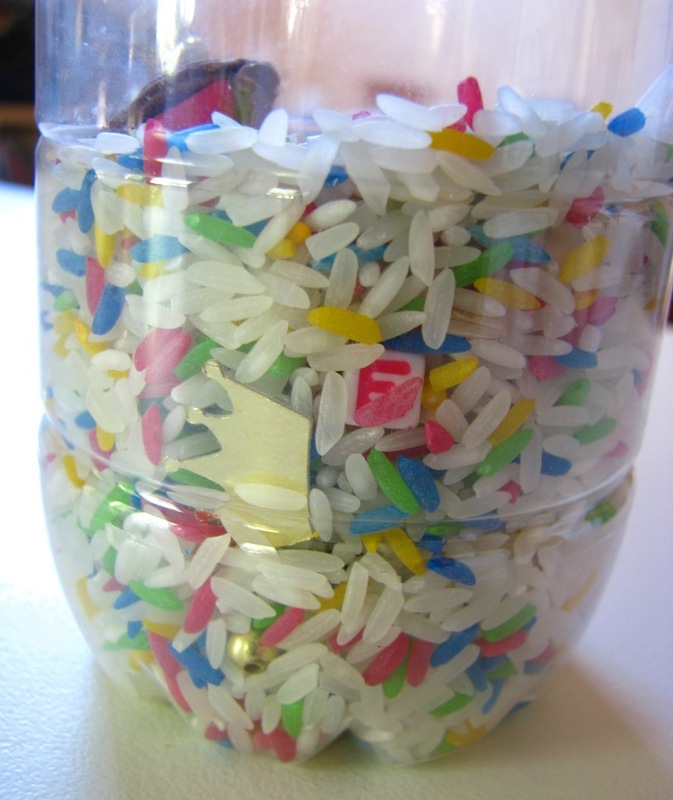 The gragger part is easy – an empty plastic bottle containing some rice. You could also use uncooked pasta, dried lentils etc, but rice is relatively quiet when shaken, plus you can easily dye it lovely colours by putting rice, a squirt of food colouring and a teaspoon of white vinegar into a ziplock bag and shaking/rubbing until the rice is evenly coloured. My daughter enjoyed helping with that! I used a cup of rice per 600ml bottle but go with what looks good to you. A few good ideas, but you can invent more! – a tiny book or scroll that King Ahashverosh checks when he can’t sleep, finds Mordecai’s deed within. I used the items I could get hold of (or make) most easily, but it would have been fun to use all these ideas. (Thank you Joanna!) The children I was making the graggers with are quite young – 2-3 years old, so I made a list of the items and laminated it so it could be tied to the neck of the bottle as a reminder of who is in the story and what could be found if you looked. The kids loved putting things into the bottle and shaking it all up. 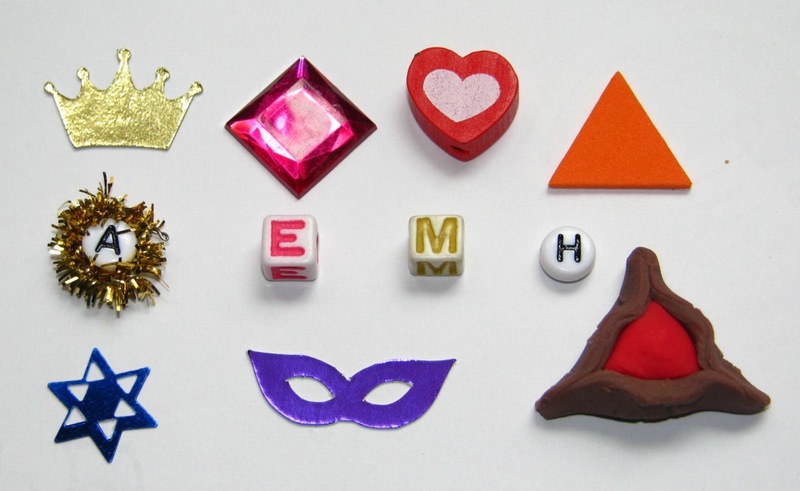 We then had a great rendition of my Purim story for young children (ie the G-rated version) with accompanying Purim spoon puppets, and tested out some new hamantaschen recipes. And now we’re all set for Purim!